Astrodon johnstoni illustration by Dmitry Bogdanov on Wikipedia (use permitted with attribution: CC BY 3.0). 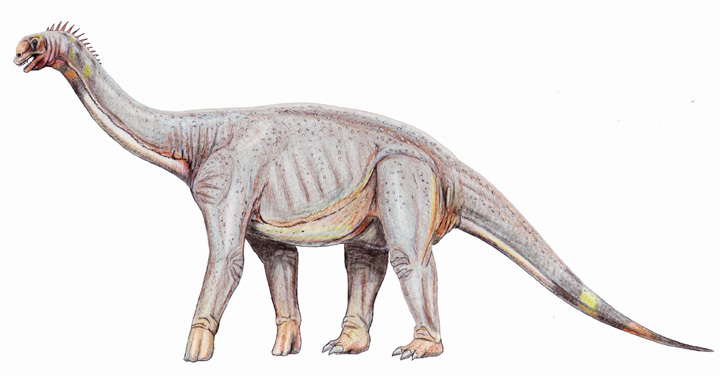 Astrodon johnstoni lived in Maryland from 95 to 130 million years ago during the Early Cretaceous period. These giant sauropods weighed up to 20 tons; they had small heads, long necks, long tails, and strong, solid legs. Adult Astrodons could be 50 to 60 feet long and more than 30 feet tall. They were herbivores, probably feeding on conifers, ferns, and other plants. Astrodon johnstoni's fossil teeth were found in 1858 (one of the earliest dinosaur finds in this country and the first in Maryland).